Former Wisconsin governor Jim Doyle opened the conference by reflecting on his work as one of the Compact’s architects. Doyle acknowledged the Compact’s primary feature, a general ban on diversions of water outside the basin, and also highlighted lesser known provisions resulting in the creation of a framework for employing sound science in the joint management of the Lakes. He struck a note of caution, however, predicting that thirsty regions across the country are still focused on the Great Lakes as a potential water source, and at some point “people will go to Congress and say we have to get rid of [the Compact].” The Compact will not be fully tested, Doyle suggested, until water shortages strike broad swaths of the country, including areas outside the Great Lakes basin but within the Great Lakes states. The basin line bisects Wisconsin. Would a future Wisconsin governor remain committed to the Compact even if severe water shortages struck Madison or other Wisconsin communities just outside the Basin? Doyle urged audience members to ask all candidates for public office about their commitment to the Lakes and the Compact. 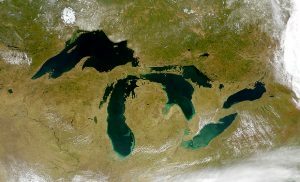 Noted author and journalist Peter Annin, an expert on the history of battles waged over Great Lakes water, said that he believes the “Lakes have never been better protected” from large scale diversions, thanks to the Compact. However, he also expects more and more applications to be filed seeking an exception from that ban. He traced the history of water diversions approved to southeastern Wisconsin communities such as Pleasant Prairie, Waukesha, New Berlin, and Mt. Pleasant. The last of these has been especially controversial, Annin said, because most of the water will serve the Foxconn complex. Annin reasoned that litigation over the Foxconn diversion and related Compact provisions is not unexpected, and in fact will help refine the edges of the Compact as courts have done with other environmental laws. Shaili Pfeiffer of the Wisconsin Department of Natural Resources praised the structural groundwork the Compact has created, including quasi-governmental entities such as the Compact Council and Regional Body that do the on-the-ground work of administering the Compact. Tasks such as water use reporting, cumulative impacts assessments, data collection, and interjurisdictional Lakes management activities represent significant advancements that would not be possible without them. She also noted that predecessor laws contained no forum, standards, or processes to evaluate diversion requests, a deficiency that the Compact squarely addressed. Speaking on the same panel, David Ullrich of the Great Lakes and St. Lawrence Cities Initiative expressed strong support for the policy underlying the Compact but questioned its implementation. Diversion approvals seem to have become the rule rather than the exception, he said, especially in southeastern Wisconsin’s “hot spot” for Compact controversy resulting from a heavily populated and developed yet geographically narrow Great Lakes basin in the region. In the end, the conference participants (and audience members) expressed optimism about the future but recognized that much fine-tuning remains to be done. A full video recording is available here, and media coverage is available here.